One of the most annoying problems of outdoor grilling is how to dispose of the trash. It can be exasperating to keep a big trash bag from blowing all around instead of close to the grill where you need it. And it is unsightly to have a big trash can with the lid off. 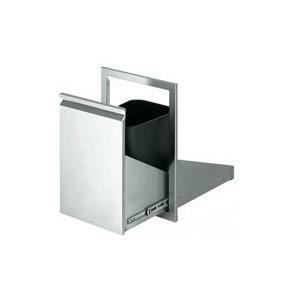 This trash can pull out drawer can be installed right into the masonry that is housing your gas grill by leaving a cutout of 15" W x 25 1/2" H. Opening the drawer is easy with commercial quality drawer glides so the mess is hidden inside the large capacity trash bin. For installation in a masonry surrounding. Commercial grade drawer glides for easy opening and closing. Leave a cutout of 15" W x 25 1/2" H in masonry to install. How deep is this item? The manufacturer states the depth is 19 1/2.